Majorca or Mallorca is the largest of the Spanish islands in the Balearics/Baleares. The name comes from the Latin Maiorica which means "the larger one" of the islands compared to Minorca/Menorca which is the smaller one. Located as it is in the Mediterranean it has long been on trading and shipping routes from North Africa to Europe. It is because of this position that it has had numerous invaders, settlers and pirates who have wanted to locate there. Though you won't find many modern day pirates in the stairlifts industry there are a few still about so it is best to approach a company with the experience and pedigree of Castle Comfort Stairlifts who have been succesfully supplying mobility equipment and giving people their independence for 15 years now, and have the testimonials plus fully bi-lingual (English and Spanish) staff located in Majorca. The climate is sunny nearly all the year round with only a few inches of rain depending on whereabouts you are on the Island. For instance in the mountains there are on average 55 inches of rain a year, whilst on the southern plain it is about 11 inches per year. For comparison Manchester gets 3 times that amount. Many people are attracted to the island for what it offers tourists, which are the main contributor to the islands economy. However there are still olive oil groves, terraced vineyards and fruit and vegetable production especially in the pine forest strewn mountainous areas. It may come as a surprise to many people that Mallorca has mountains when their image of the island is of its many beaches. From busy tourist spots with many thousands of visitors in high summer to smaller private coves frequented by locals Majorca has a lot to offer the sun worshipper. According to some fact finders the island has 250 miles of coastline, for others it is reported as having 554 miles of coastline and one commenter online says they have 3500 miles of coastline. I can only think that they were sampling cervezas at each beach on the way round and they couldn't decide what it was! Luckily if you can't decide on the best measurement for a stairlift for you then our friendly advisers in Palma will be happy to help you. There are a lot of historical attractions away from the busy coast including the Bellver Castle pictured previously and originally built by King Jaume II. The island flourished under his rule as prior to this point it was controlled by the Moors who kept robbing Catalan boats as they went past in the Mediterranean. His father King Jaume I put a stop to this in 1229 and took it from the Moors and then gave the island to his son. Agriculture started, coins were minted and new towns were all built during his reign. There is also the World Heritage site of the Serra de Tramuntana which is the 90km long and 15 km wide mountain range running through the island. The largest peak is Puig Major which is the tallest mountain in the Balearics. There are approximately 14 days of snow there each year! The food is what brings many people back to holiday in Majorca each year. With a great climate the local Mallorquin cuisine has many speciality dishes. Some to try include fideua which is the local paella dish. In fact with so many different choices to try many people opt for the Tapas Variadas which gives people a variety of tastes. 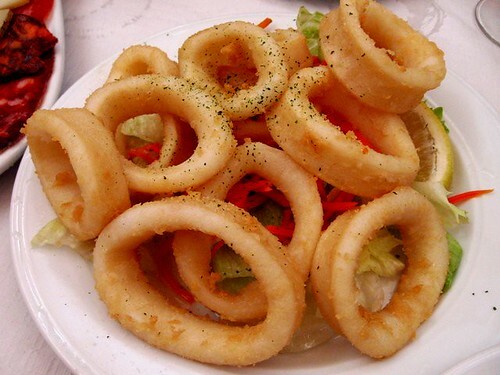 These could include meat or vegetables, meatballs in sauce, calamares, olives or cured meats. Wherever you go on the island make sure that you at least visit the markets to get a flavour of the people, customs and culture of the place. Each town has at least one market and the capital Palma has 7 different markets from fish, fruit and vegetables through to fresh flowers, crafts, livestock and the flea market. It's best you get there before 10.30am, in fact the earlier the better, as most open at 7.30am and the freshest produce will be at it's best then. 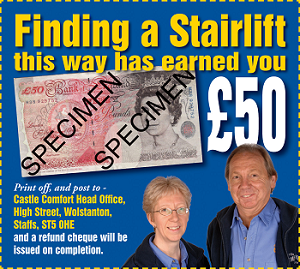 For the best prices in the market on a stairlift give us a call. We also arrange gruas de piscina which are lifts for getting in and out of the swimming pool. can u put a stairlift outside up some garden steps as the villa we have bought with friends has lovely gardens but i want my dad to come and visit and he has parkinsons. Outside stairlifs are very possible. All that is needed is a power supply and we can arrange that too if necessary. Many people with a variety of health conditions benefit from stairlifts (or sillas de salvescaleras) as they are known in Spanish. We have many customers in Spain and its islands with Parkinsons. Let us know if you need a free survey. Are Spanish/French Stairlifts just the same as stairlifts in the UK ? Mme Eiffel - yes because they are all British! No stairlifts are made in Spain or France. We have couple of smaller manufacturers in Germany and Italy, but the vast majority of chairlifts instaled in the world are British or American. 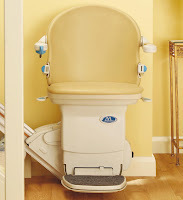 In fact apart from Stannah and Minivator (the Handicare group) - the roots of all our stairlift makers here in England are in Yorkshire - and most of those from the Keighley region. This is because one of the first factories producing stair lifts was in Keighley and a lot of technicians acquired there skills in this area. As they still lived there - other firms developed such as manufacturers such Acorn, or Brooks (Brooks is is the same as Acorn - 2 brands together) Bison Bede, (now defunct and owned by Acorn) Bespoke Stairlifts - a producer of reconditioned curved stairlifts etc etc.